The small Celtic kingdom of Cernyw was, according to tradition, founded out of a western chunk of the former Silures territory around AD 437, by Eugenius, the son of High King Magnus Maximus. This was the most Romanised area of Wales, and many early rulers bore Romanised names (which are shown ahead of the later Welsh forms of their names in the text below). However, if the territory of Eugenius had a Romanised name, it has long been lost. Instead it was known only as the 'Kingdom of Mid-South Wales' by later chroniclers. It may have been formed of Cernyw and Ewyas, but the apparent separation of Ewyas around 440 is probably what caused Cernyw to appear as a kingdom in its own right. Prior to that it may have been more of a protectorate or a frontier zone in the style of the Saxon Shore. Despite the legend that claims that the death of Eugenius was due to a ferocious battle with a giant, it is likely, given his geographical position, that he died in battle against Irish raiders. Cernyw was situated west of Gwent (which was partly formed of old Ewyas) and its name is often confused with the Corniu of western Dumnonia (later Cornwall). By the time Claudius (Glwys in Welsh) came to power, Cernyw had certainly shrunk to the area that formed the later and better attested kingdom of Glywyssing, and was renamed as such in Glwys' honour. The earliest form of the name may have been Glywyssion, or perhaps Glywyssiog, but Glywyssing is the medieval name, and its modern version is Glywysg. The kingdom comprised three main regions, probably created with the same borders as their preceding Roman cantrefi: Gwynllg (the far eastern part of Glywyssing); Penychen (the centre), and Gorfynedd (the westernmost section). They were often ruled almost as separate kingdoms, or sub-kingdoms, with one of the three rulers filling the role of nominal overlord. The customs and traditions of the region's people would have been part-Roman and part-Silures, a mix that was perhaps similar as in regions such as Caer Baddan or Ebrauc. 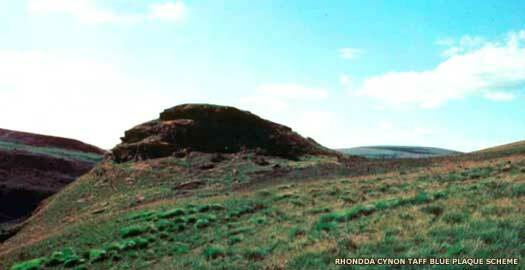 The hill fort of Dinas Powis (or Dinas Powys in its later form) lay within Cernyw's territory. It also lay in a more-or-less straight alignment with the hill fort of Brent Knoll across the Bristol Channel, Glastonbury Tor, and Cadbury Castle. They probably formed part of a chain of communications before the coming of the Romans. 'King of Mid-South Wales'. Son of High King Magnus Maximus. Immediately prior to Vortigern's apparent rise to power as High King, the country is subjected to raids along its coastline. 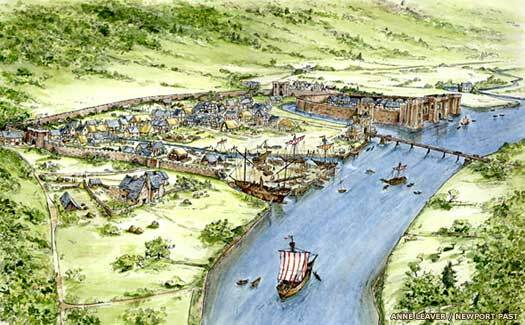 In the west, Irish raiders sail up the Severn and seize a large amount of booty in the form of corn, cattle and anything else they can grab, including sons and daughters. They are also credited with kidnapping the young St Patrick from the College of Theodosius (at Llantwit Major, which would place the raid within the territory of Mid-South Wales, in the region of Gorfynedd). Around the same period in time, another set of Irish raiders have already become established in Dyfed. One of their number, Anlach, marries Marchel, whom Celtic works describe as the 'heiress of Garthmadrun'. The same works give Anlach's father as Cornac or Coronac, who is generally linked to Cormac mac Urb of the Irish Déisi. Given the calculation that the Déisi had arrived in Dyfed around AD 300, this would give them ample time to become integrated into the regional nobility and for their leading sons to marry the offspring of the surviving Brito-Welsh nobility, hence Anlach's marriage to Marchel. Her status as 'heiress' would suggest that Garthmadrun is a parcel of territory that has been assigned to her from a larger territory, most likely the 'Kingdom of Mid-South Wales'. Her son converts Garthmadrun into Brycheiniog. By this time, although Ewyas may still form part of the territory of Mid-South Wales under the 'protector', Eugenius, it appears to fall under the control of High King Vortigern, now the most powerful man in Britain (and traditionally held to be the brother-in-law of Eugenius). He grants the territory to his eldest son, Vortimer, and the new kingdom emerges as Gwent. According to tradition it is Eugenius himself who renames the remainder of his territory as Cernyw (around 437), but it may also be a later recognition of the loss of the eastern territory, perhaps under Marius. Despite apparently holding the territory under his command in relative safety for up to forty years, Eugenius meets his end in battle, probably against Irish raiders. His son, Marius, succeeds him in ruling what is now in the process of becoming the kingdom of Cernyw, rather than a possible protectorate or Romanised territory of Mid-South Wales. In some literature, Cadell Ddyrnllwg of the Pagenses is claimed to be responsible for sending 'out a branch into Glywyssing' (Glywyssing being the later name for Cernyw), which would suggest that he places a family member on its throne. It seems an unlikely claim given the hereditary nature of the succession in Cernyw, but perhaps the line of succession here has been manipulated to show a direct descent from the greater figure of Eugenius. Son. Protector of Cernyw in the Roman sense, rather than a king. Dumnonia is divided by Constantine Corneu, with the main kingdom going to his son Erbin. Cornubia is governed as a sub-kingdom by Erbin's younger brother, Merchion. The Latin form of his name is probably Marcianus, which is linked to Marius of Cernyw. However, there seems to be no sign in Cernyw of a son called March or Mark (who certainly seems to have existed later in Cornubia), so perhaps the two are separate figures who have been linked by mistake. Son. Apparently emigrated to Armorica and ruled Cornouaille. Brother. King of Cernyw, perhaps the first to assume this title. Claudius succeeds to the kingdom, although he is better known by the later Welsh version of his name, Glwys Cernyw, or even St Glwys. He may have been born in Caer Gloui (due to the similarity between the names), and is commonly believed to be the source of the origin of the kingdom's better known name of Glywysyg. He supposedly marries Gnawl, daughter of King Ceretic of Ceredigion, and the couple have twenty sons and one daughter. The daughter, Dyfwn, marries Meurig ap Caradog of Gwent, sowing the seeds of later unity between the two kingdoms. 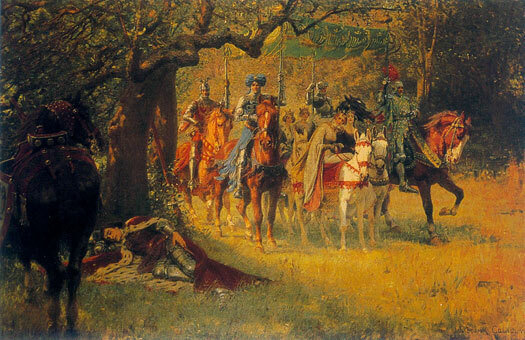 Claudius may also be the source of the Arthurian character of Sir Cligés. While studying the naming conventions for many of the smaller Welsh kingdoms, Heather Rose Jones agrees with the idea that Glywyssing originates from 'Glywys' which has the root 'Gly-' from Glevum (Caer Gloui) plus the Welsh derivative (-wys) of the Latin suffix '-ensis', meaning roughly 'the inhabitants of a region'. This delivers the meaning of Glywyssing as 'the land of the inhabitants of the land of Glevum' suggesting perhaps that residents from Glevum end up here in the dark years before the victory of Mons Badonicus. However, Jones is of the opinion that Glwys himself is a later invention to account for the kingdom's name, which would suggest that Glevum conquers Cernyw, perhaps under the leadership of Claudius, and founds its own kingdom in its place. Son. King of Glywyssing. Kingdom renamed after him. Upon the death of Claudius, the kingdom is divided between his three sons. This is highly traditional Celtic practice, but it often serves to weaken territory, laying it open to piecemeal conquest, increased raiding, or internecine conflict. In this case, the kingdom is divided into its three constituent regions, Gwynllg, Penychen, and Gorfynedd. The British kingdom of Glywyssing was a late fifth century renaming of Cernyw, which itself had grown out of the Roman-created territory of Mid-South Wales. The kingdom comprised three main regions, probably created with the same borders as their preceding Roman cantrefi. Gwynllg (or Gwynllwg) formed the far eastern part of Glywyssing, bordering Gwent and generally (although not entirely) divided from it by the River Usk (Brythonic Isca, just like the one flowing through Dumnonia), with a capital at Allt Wynllyw on Stow Hill (in Newport). It was known in later stories as the cantred (cantref) of Wentloog (a later Anglicised form of Gwynllg, which has a very similar sound). Penychen formed the central region of Glywyssing, being divided from Gwynllg by Afan Elerch (the River Elerch or Eleirch), otherwise known as the Greater Rumney, which was ruled from Nant Pawl. Gorfynedd was the westernmost section, the territory including the Gower Peninsula, which was ruled from Llaniltud Fawr (Llantwit Major) and which had suffered an Irish raid around AD 420. The three regions were often ruled almost as separate kingdoms, or sub-kingdoms, with one of the three rulers filling the role of nominal overlord, but in this period they were fully independent of one another, being ruled by the three sons of Claudius of Cernyw. Their names appear to reflect a decline in the Romanisation of the region and a return to more traditional values. A fourth region is also claimed, that of Edeligion, which was ruled by another son of Claudius and which was located in the very east of Glywyssing. It appears to have been short-lived and was probably quickly absorbed into Gwynllg. Eldest son of Claudius. King of Gwynllg & overlord of Glywyssing. Gundleus of Gwynllg (later known as Gwynlliw Farfog, the warrior), holds court at Caerfule (Castrum Buleum) in 'the area of Newport'. Despite an early life reputed to be filled with warring and piracy, in later life he founds the church of Gwynlliw in Newport, which is consecrated in the name of St Mary and is later incorporated into St Woolos Cathedral of the Celtic Church in Newport (Woolos is an English approximation of his name). He marries the daughter of Brychen of Brycheiniog, thereby sealing good relations with his northern neighbour. Brother. King of Penychen. Left the kingdom to his nephew. The death of Gundleus of Gwynllg in this year (although the year 500 is given as an alternative) sees his son, Catocus, succeed him. Better known as St Cadwg (or Catwg, the spelling is variable) he travels widely and becomes one of the greatest of Welsh saints. He is supported by an Irish monk who may or may not be the Patrick who has been working so hard in Ireland (although most likely not, as Patrick seems entirely to be a fifth century figure). More locally, the territory or perhaps sub-kingdom of Edeligion receives little mention in tradition, so its ruler probably dies relatively early. Edeligion becomes part of Gwynllg and is soon forgotten. During his lifetime, Edelig is notable for one action, that of donating land to St Cybi so that two churches can be founded, at Llangybi-on-Usk and Llanddyfrwyr-yn-Edeligion, after the king tries and fails to have the saint ejected from the kingdom. Son of Gundleus. King of Gwynllg & Penychen. Killed by English. Sister. A humble shepherdess, killed by sheep robbers c.520. The death of the heirless Pawl of Penychen sees his kingdom pass to his nephew, Catocus. The young king is therefore able to unite the eastern and central parts of Glywyssing, although it appears that they retain their names, perhaps while the third region, Gorfynedd remains independent. According to tradition (in the form of the 'Lives' of the saints), Catocus has no heirs when he is killed during an enemy raid while he is church-building in Calchwynedd. As a leading light of the British Church, he has been elected abbot of a large body of monks in what is traditionally known as Beneventum (Bannaventa) in Calchwynedd. During the enemy raid (meaning Angles or Saxons) he is run through with a spear, presumably by the Ciltern Saetan or Middil Engle. It is one of the few more accurately datable events in the kingdom (if indeed it can be placed here - most sources state that the murder takes place 'near Weedon', which is only (five miles) from the then-ruins of Beneventum). The 'Lives' also state that Catocus had been living amongst Saxons in the area in order 'to console the native Christians who had survived the massacres of the pagan invaders'. Catocus leaves his joint kingdom of Gwynllg & Penychen to his uncle by marriage, Meurig, king of Gwent which kingdom borders him to the east. It is possible that soon after, Meurig also gains Gorfynedd, as he is named as ruler of Gower, which falls within this region as the westernmost part of Glywyssing. The kingdom remains part of Gwent until Rhys ap Ithel of Gwent rules it as a separate kingdom (or perhaps a sub-kingdom). This Welsh kingdom had been divided into its three constituent territories in the late fifth century. During the course of the sixth century it was reunited in stages, but perhaps only after it had been gained through inheritance by the king of neighbouring Gwent, which lay to the immediate east of the kingdom. Gwent managed to hold onto it as part of a greatly enlarged single kingdom for around two centuries, but old habits died hard, and Glywyssing was hived off as a junior or sub-kingdom for one of the sons of Ithel ap Morgan, Rhys. Thereafter it seems to have remained relatively stable throughout the remainder of the eighth century and into the ninth. Son of King Ithel ap Morgan of Gwent. According to tradition, Meyryg ap Rhys is a man of great cruelty. Despite founding a castle at Caerleon upon Usk and another at a place called Meigen cil Ceincoed, near the River Elerch or Romney, he is launched to his death from a high cliff by nobles for daring to molest a noble's daughter. Brother. m Braustud, dau of Glowd ap Pasgen of Builth. The name Arthfael is particularly telling. The first part is clearly in honour of Arthur, the late fifth century hero of the Britons, while the second, 'fael', means 'servant. People had been, and remain, so impressed with Arthur that this servant name which is usually used in relation to deities had been coined from his. Following this Arthfael's death, Glywyssing is apparently taken back into Gwent, probably during the reign of Ithael of Gwent. However, this is a brief change, and Arthfael's son, Rhys, soon appears to gain control of his birthright. King Ithael of Gwent is killed in battle against King Elisedd ap Tewdr of Brycheiniog, perhaps sparking a feud that soon draws in Glywyssing's king, Hywel ap Rhys, who himself is the father or cousin of Ithael. In this period, Hywel comes into conflict with the king of Brycheiniog, Elisedd ap Tewdr, over the districts of Ystrad Yw (Crickhowell, now in southern Powys but seemingly inside the border of Brycheiniog in the ninth century) and the remnant of Ewyas (adjoining Ystrad-Yw, Gwent had succeeded to Ewyas before its subsequent division as Ergyng and then its loss to the Mercians by the ninth century). The territories are claimed by Hywel as the rightful possession of Glywyssing (although the claim seems dubious, as only its eastern neighbour, Gwent, could lay any realistic claim to Ewyas, and Hywel's familial relationship to Gwent's still extant kings should not change this). Brycheiniog has already transferred its claim to those lands to Cadell, the king of South Wales (probably Cadell ap Rhodri of Seisyllwg, who also holds Builth), so Hywel is forced to relinquish his right to them and has to set the boundary of his kingdom at Ystrad Yw. It is here that boundary stones have been raised and the town and castle of Cerrig Hywel (Gerrig Hywel, or 'the stones of Hywel') has been constructed. The latter is later considered to be in Brycheiniog. This forms the boundary between Hywel and Cadell during the former's lifetime. Son. King of Glywyssing & Gwent. Vikings have been wintering at Quatford (near Bridgnorth), but in the spring of this year they ravage the kingdoms of Brycheiniog, Gwent, and the Gwynllg region of Glywyssing. Asser records that Elisedd of Brycheiniog requests help from Alfred of Wessex, but another reason for this may also be due to pressure from Anarawd ap Rhodri, the powerful king of Gwynedd and Deheubarth who is keen on expanding his areas of control. Rule of the kingdom of Gwent appears to pass to Owain ap Hywel shortly before his death. Then in 927 it becomes tributary to Æthelstan of the West Saxon united English kingdom along with Glywyssing itself. By about 930 it seems to be ruled by Morgan Hen Fawr, which makes him over-king of all of Glywyssing and Gwent under the new name of Morgannwg (modern Glamorgan), while his two brothers rule sub-kingdoms within former Glywyssing. The year 950 was a dramatic one for Wales. The death of Hywel Dda of Deheubarth, over-king of all Wales (or perhaps even High King, following the ancient tradition), left the country divided. While Hywel's sons, Owain, Rhun, Rhodri and Edwyn, took possession of his estates in South Wales, Iago and Ieuaf, the sons of Idwal Foel, seized North Wales as their birthright (Gwynedd and Powys). The two sides disagreed strongly over the break-up of a united Wales, but the joint kings of Gwynedd were strong enough to enforce their will. Glywyssing, which had retained its kings even during the reign of Hywel Dda, continued to govern itself independently, but now under the name of Morgannwg. After succeeding his father as king of Glywyssing and Gwent around 930, the 'adventurer', Morgan the Old and the Great, renamed his combined territories of Glywyssing and Gwent after himself. The old cantrefi of Gwynllg, Penychen and Gorfynedd in the former were retained. However, Gwent regained its independence soon after Morgan's death, or perhaps even before it. King of Morgannwg (former Glywyssing & Gwent). Brother. King of Gower (Gwyr, formerly within Gorfynedd). Brother. King of West Glywyssing. Gwent appears to regain its independence, either around 955 with the accession of Noe or about 970 when Arthfael becomes king there. The period is highly confusing when it comes to working out just who is ruling in Morgannwg, with power apparently being shared by brothers on occasion but also with some individuals being mentioned by some sources and not by others, leading to conflicting dating. Gwrgan especially is a mysterious figure, given a long reign (where he is shown) and fathering the kingdom's last ruler. Son. Possible co-ruler or king in Owain's place. Not always shown. Not in all lists and rule is uncertain. Son-in-law. m Eva ferch Gwrgan (Eva daughter of Gwrgan). Brother and co-ruler. Retained his role under Rhydderch ap Iestyn. Son. King of South Wales (1023). Slain by Irish, details unknown. Uncle and continued co-ruler since c.990. Deheubarth has long been under the dominion of Gwynedd, but when King Llywelyn ap Seisyll of Gwynedd dies unexpectedly, Rhydderch ap lestyn seizes the throne of Deheubarth by force, albeit holding onto it briefly before he is forced out. Son. King of South Wales (1045-1055). Killed in battle. Gruffydd ap Rhydderch is able to seize Deheubarth from Gruffydd ap Llywelyn of Gwynedd and hold onto it for a decade until the tables are turned. With this act he controls all of south Wales, perhaps using the title of 'King of South Wales' to emphasise his sudden greatness. During the very same period - 1045-1055 - Hywel ap Owain's son Meurig rules Gwent. Gruffydd ap Llywelyn of Gwynedd invades and conquers the kingdom, along with neighbouring Gwent, subjugating them both and drawing them directly under his control along with Deheubarth as part of a united Wales. Following his death, united Wales breaks up, and independent control of Morgannwg and Gwent is re-established. Morgannwg is seized and merged with Gwent as the greater Morgannwg that had been created by Morgan Hen Fawr around 930. King of Greater Morgannwg (Glywyssing & Gwent). Deposed. Son of Gruffydd ap Rhydderch. Vassal of Gwent. Caradoc manages to overthrow Cadwgan and seize control of Morgannwg (Glywyssing and Gwent combined), which he rules for the remainder of his life. Control of Gwent is passed to his successor, Iestyn ap Gwrgan. Seized throne of Greater Morgannwg (Glywyssing & Gwent). Attempting to emulate the achievements of his father and grandfather and become king of south Wales, Caradoc drives Rhys ap Tewdwr Mawr of Deheubarth from his throne. He is immediately faced by the threat of that king returning in alliance with Gruffydd ap Cynan, who is pursuing his own claim for the throne of Gwynedd. Gruffydd also gains the cooperation of his nemesis in Gwynedd, Trahaern ap Caradog, and Meilir ap Rhiwallon of Powys. Caradoc is killed at the Battle of Mynydd Carn, as are Trahaern and Meilir, allowing Gruffydd to seize his birthright in Gwynedd and Rhys to regain Deheubarth. Son of Gwrgan. Last king of Morgannwg. With a base of operations that is believed to be at Dinas Powis, to the south of Cardiff, Iestyn ap Gwrgant gains the throne following the death in battle of Caradoc. Morgannwg (and its eastern constituent, Gwent) is conquered by the Normans under Robert Fitzhamon, lord of Gloucester, given them control all of south-east Wales. The lowlands of Glywyssing become a lordship under Norman knights and their descendants, while a separate lordship is established in Gower. The mountainous inland regions remain unconquered. Eldest son. First lord of Afan. With the death of Iestyn in the mountains, any claim of a surviving independent kingdom ends. Iestyn's eldest son does not pursue his own claim to the lost throne, instead accepting the Norman conquest as a fait accompli. He is allowed to retain lands between the River Neath and the River Afan, with the title 'Lords of Afan' being applied to his descendants. The mountainous regions remain unconquered for some time afterwards, but no attempts to reclaim the kingdom are launched from there. The lords of Meisgyn, descendants of the last king of Morgannwg, remain in command of the mountain above Maerdy, upon which they build Castell Nos. The last of the Princes of Wales are killed in 1282, ending Welsh independence. The Morgannwg region is reformed as the county of Glamorgan after the marcher lordships are abolished in 1535 by Henry VIII of England. In 1644 the earldom of Glamorgan is created, and survives to this day, as does the lordship of Gower (the title is still used by the dukes of Beaufort).